When given a choice, many people express a preference for natural materials and other elements that incorporate or evoke nature. It turns out that there is more to that preference than just personal taste: a growing body of research suggests that exposure to nature or its elements can result in an impressive list of beneficial effects, including but not limited to better learning rates, lower blood pressure, reduced stress, and faster healing. The preference for nature has a name: biophilia, which literally means “love of life,” an affinity for living things and the natural world. The “biophilia effect” describes any of a number of positive impacts experienced when this affinity is evoked through a sensory experience of nature: sight, sound, smell, or feel. With architecture, the biophilia effect spans a broad range of elements that include positive personal responses to daylighting, views of nature, use of patterns, and use of natural materials, such as wood products. Several studies have focused on identifying design elements that correlate with improved learning outcomes in schoolchildren. According to the U.S. Department of Energy’s National Best Practices Manual For Building High Performance Schools, daylighting classrooms is the cornerstone of best practice in school design. This is supported by research: Student learning rates in daylit classrooms have been measured at levels up to 26 percent higher than those of students in classrooms that were not daylit (Heschong-Mahone Group, 1999.) Admittedly, there are many confounding factors in classroom studies; however, an overwhelming correlation between exposure to natural light and higher student achievement was consistent among the classes that were the subject of this study. Including daylight is a relatively straightforward tactic, and considering the promising research on its benefits, it’s unsurprising that the DOE considers it foundational to good school design. 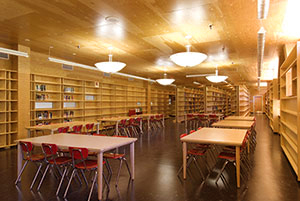 For several case studies and more information on school design in general, visit APA’s schools page: http://www.apawood.org/schools. A nature view out of the window is more than just pleasant; in fact, a nature view can help patients heal faster. In one frequently cited study, patients recovering from gallbladder surgery that had a view of trees outside their windows recovered faster than patients whose windows faced a brick wall (Ulrich, 1984). On average, a nature view decreased patients’ hospital stay by about 19 hours, not quite a full day. While quicker healing is desirable in itself, it also carries a significant economic benefit—time spent in the hospital is often billed at considerable rates in the United States. A Canadian study showed that wood in interiors was perceived by a majority of subjects as more “warm,” “inviting,” “homey,” and “relaxing” than all other tested materials (Rice et al, 2006). The top-rated rooms in the study were “completely wood dominated, containing little to no artificial materials and having large windows with views of nature, while the bottom five rooms were characterized by a marked lack of anything natural,” and the lowest-rated room of all, a modern living room, was perceived as “cold” and “uncomfortable” by most respondents. A positive emotional response to wood was not universal, however, a large majority of subjects in the study expressed sentiments favoring wood. Material choice may also have an influence upon physiological health. A Japanese study comparing physical and emotional responses to viewing wood versus steel panels found that wood had both physiological and psychological advantages over steel (Sakuragawa et al., 2005). Wood panels were associated with decreased depression or dejection, while steel increased both. Aside from mood, researchers measured a difference in blood pressure as well: wood panels were associated with decreased blood pressure or no change, while steel was associated with increased blood pressure. Wood was also associated with decreased blood pressure in an Austrian study; high school students who were taught in classrooms with floors, ceilings, and walls finished in real wood had lower heart rates than students taught in classrooms with no wood elements (Kelz et al, 2011). Besides having lower heart rates, students in the wood classrooms also reported lower levels of stress than those in non-wood classrooms. While research into the biophilia effect is still in its early stages, it is a rapidly growing interdisciplinary field. Its results point toward myriad benefits to be gained from using biophilic principles in design of commercial and public projects, many of them straightforward to implement with readily available resources. Heschong-Mahone Group. 1999. Daylighting in schools: An investigation into the relationship between daylighting and human performance. C. Kelz, V. Grote, & M. Moser. 2011. Interior wood use in classrooms reduces pupils’ stress level. J. Rice, R. Kozak, M. Meitner, and D. Cohen. 2006. Appearance wood products and psychological well-being. S. Sakuragawa, Y. Miyazaki, T. Kaneko, and T. Makita. 2005. Influence of wood wall panels on physiological and psychological responses. N. Salingaros. 2012. 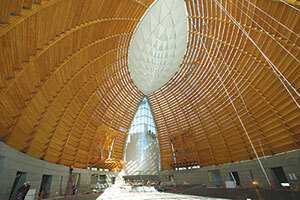 Fractal art and architecture reduce physiological stress. R. Ulrich. 1984. View through a window may influence recovery from surgery. US Department of Energy. 2007. National Best Practices Manual for Building High Performance Schools.